When collecting credit information from you the three credit reporting agencies Equifax, Experian, and TransUnion, receive their data from companies that do business with you. Each agency has data on you and your credit accounts in order to create a full report at the end of each year. Even though they get their information from the companies that do business with you there are a few occasions where you can add your own information directly. As you earn positive information regarding stability and account history it is imperative to add that to your account. The most important task when creating good credit is to pay your bills on time. This will have a positive impact on your score and also show you can handle your current situation. If you have enough money at the time you receive your bills you can even pay them before the statement date. This can reduce your balances that are being reported and you can still use your credit cards for the remainder of the month. Additionally, if you keep old accounts open for a long period of time you can enhance your score. This will also show the bureau that you are capable of maintaining your bills. In contrast, if you find yourself with negative information on your credit report you have a few options to dismiss it. Everyone has the right to add a 100-word statement to explain why this negative information occurred. It is important to note that this information has zero influence on your credit score, but it might help explain why you have negative reports in the first place. 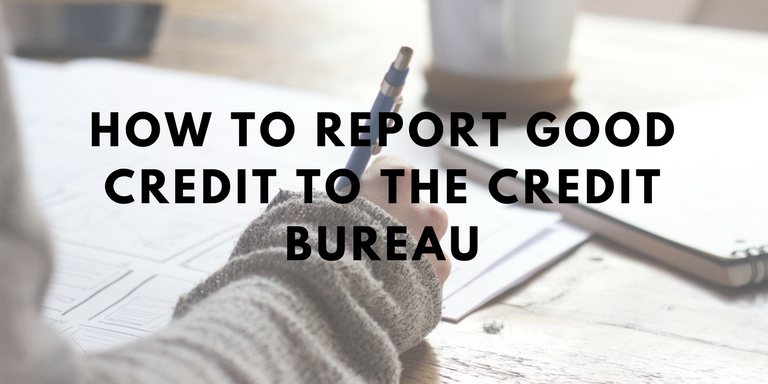 This will help when lenders or employers are asking questions about bad credit when reviewing your report. Furthermore, lenders like to see personal information that proves you are a stable person. This information includes your address, telephone number, your current employer, your previous employer, and your social security number. These items do not affect your credit score, but lenders will like to see them when creating your report. It is fairly common that you have to send a letter that includes proof to document this information to the credit agency so they can verify who you are. Sensitive information will have to be sent, so make sure you take the right steps to secure the package. Even though there are a few occasions where you can add your own information directly you should always make sure your account information is correct. You should take the time to review each report to compare all information on each account. If you do not get one of the three reports from each bureau you have the right to request reports by calling and informing them which one you need. If you find flaws make sure you take care of them sooner than later because it may impact your credit score. 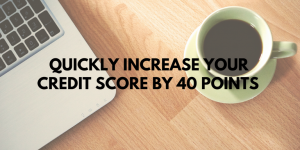 Although trying to quickly increase your credit score by 40 points might seem like a daunting task it can open a range of options. A 40 point increase could make a big difference when applying for an apartment, a car, or even a new job, so with some perseverance, you can potentially make a change in a short period of time. 1. Always make your monthly payments on time. Improving your history of payments is a simple way to see your credit score rise. If you have an issue with lenders reporting you a day or two late, call them to see if they can change your on-time payment. This could be offered to you if you are not a frequent offender. The other option is to remove a late payment. You can try to file a dispute against the payment for inaccuracy. You can also call the original creditor and ask for a goodwill adjustment. If they do not allow you to add the adjustment you can negotiate by asking for automatic payments. This will show your interest in keeping up with monthly payments. The good thing is that the impact of past credit issues fades as time passes. Try to keep up with good payment patterns so your report will show you are handling your credit well. 2. Have positive information being reported on your credit report. The most common way to have a good report is to have a credit card where you keep use low. You should make it a point to pay your statement balance on time every month in full. Another way you can keep a good report is have a card solely dedicated to paying your monthly bills such as rent, utilities, and electricity. This will make sure that you pay your debt every month and on time. You can also pay down the balances on your existing cards to get rid of the revolving debt. If you do not want to have a card dedicated to paying rent you can add your rental payment history to your credit report. If you do this make sure you pay your rent on time. 3. It is imperative to drop credit card debt altogether. Around 30% of your score is due to the amount of credit card debt you are currently carrying. Once you cut this debt you will see an increase in your score within 30 to 60 days. Another way you can show that you are not a riskier borrower is pay your credit card balances as soon as you can before the due date. If you pay your debt before your monthly statement is due chances are your credit card company will report your reduced balances to credit bureaus. This will show that you are not risky and allow your scores to rise. 4. The last thing you can do is check your credit report for inaccuracies. Even though you have three different reports from three different bureaus mistakes can still be made. If you have reported this information before always check your yearly statement to make sure the information has been changed. This is one of the main reasons for a declining score time and time again. Be sure to report any inaccuracies you found and do not give in until you see a change. A good credit score is vital to success. Whether it’s for a mortgage or a new credit card, having good credit is important for following your dreams. Payment history is one of the most important factors for FICO Scores and can account for up to 35% of your score. Make sure all your accounts on current on payments. Late payments will remain on a credit report for up to seven years. Your balance-to-limit ratio is calculated by dividing the total of your balances by the total of your credit limits. Ideally, you want to pay your credit card off each month, but if that’s not possible be sure to keep your credit utilization rate around 30% or less. A rule of thumb is to never have utilization rates of more than 30% on any one card or in total. People with the highest credit scores tend to have a utilization rate of less than 10 percent. After requesting a copy of your credit scores, you’ll see they come with a list of factors most likely to affect your score. These risk factors will help show you what changes you can make. Once you have that list, you can easily follow it to better your score. Many creditors are willing to negotiate if you are making an effort to pay your bills as soon as possible. Avoiding creditors and continuously missing payments will continue to have a negative impact on your score. If the last time you’ve made a late payment was more than six months ago and you’ve been paying on time since then, the creditor may be open to remove the late payment, allowing your score to boost quickly. 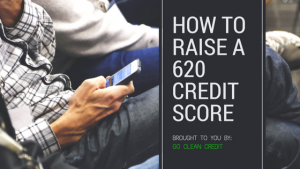 Raising a credit score of 620 is possible with a plan. These steps could increase your score by 75 or more points in 30 days and qualify you for much better interest rates. Saving money can be a difficult task when you don’t have a plan. Luckily, technology has made the money saving process incredibly easier. 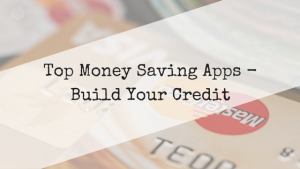 We have compiled a list of money saving apps to help you save money, as well as build good credit. Acorns is an investment app that squirrels away leftover change for your savings. It is an automated savings tool that utilizes a technique called “micro investing.” You first connect your credit card, so every time you make a purchase, Acorns automatically invests your spare change. Additionally, every dollar you invest is diversified across 7,000 different stocks and bonds to risk while still improving returns. If you’re seeking a new way to save money altogether, Chime is a bank that also operates as a money-saving service. In order to use the app, you will have to open a savings and checking account with Chime. There are many benefits to using Chime, such as the option to automatically transferring 10% of your paycheck to your savings. Chime is free with no monthly fees, foreign transaction fees, or overdraft fees. There is only a 0.01% interest rate. This money savings app goes above and beyond with a formula that calculates how much to save based on your income and spending habits. This app typically stores away money 2-3 times a week, and the amount is tailored to activity on your bank account. Digit offers a free 100-day trial, and then is $2.99 a month afterwards. You can transfer your savings from Digit back to your bank account any time you want, and can set a limit on how much money can be withdrawn. Long Game turns bad habits into a money management plan. You can set goals and choose missions to help save money. If you are struggling with gambling problems, you can play games and collect coins to actually SAVE your money. It is a game with different levels to unlock, but ultimately also helps you succeed in the real world while kicking a bad habit. The beauty of Qapital is that it lets you set your own rules. Qapital’s team is made up of a diverse team that will create a plan tailored for your money management. Qapital offers checking accounts to store your money, as well as a Qapital card, eChecks, and interest on your accounts. The card automatically saves spare change to your account, and transfers occur within seconds. You can set financial goals for yourself, and you get instant access to funds when you complete a goal. Hopefully now that you have this list, you are one step closer to reaching your credit goal. Did you like any of these? Contact us today and let us know.